Well it has finally gotten warm here in Oregon. I actually went out and "bagged a few rays" earlier before it gets too hot. While I was bagging my rays, I was reminded of some of our cruise ship adventures since for the most part we go to warm climates. The last cruise we were on didn't qualify as it was to Alaska aboard the Star Princess, and it was definitely not warm. I found myself thinking about our 2nd ocean going cruise, (our first cruise was on the American Queen River boat), starting out in Istanbul. I think it finished up in Barcelona, Spain, but since we went straight from the cruise ship to the airport we didn’t exactly establish a lot of memories about Barcelona. We arrived in Istanbul and would be spending the night on the ship which was to sail the next day. Well, most of Kathy’s luggage did not show up. In fact, all that showed up was her formal evening gowns. No underwear, no shoes, no everyday wear etc. It seemed to us that this would be a little inconvenient. The ship was overly generous and understanding and gave Kathy a free T-shirt. Oh Boy! Kathy put on a pair of my shorts and the free T-shirt and we grabbed a taxi and headed to the Grand Bazaar. 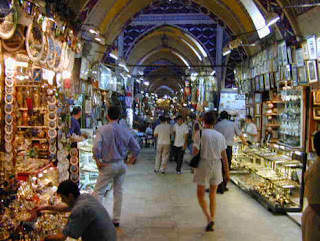 Our previous cruise had finished up in Istanbul, and so we at least had a little experience with shopping in Istanbul. I guess the most interesting part of the story is the part about finding Kathy some pantyhose. No one had any idea what pantyhose was. After many shops and much poor communication we figured out that we needed to ask to see the “See through knickers”. That did the trick. Kathy was not impressed with the underwear. She said it’s what our mothers used to wear. Kind of like wearing body armor. It all turned out pretty good. We found some Levi’s in colors never seen in the states for a very reasonable price… I think it was about $6.00 a pair. 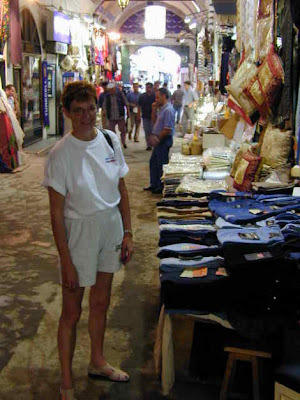 Then our next stop was in Kusadasi and Kathy found some great bargains there too. We searched way in the back streets of Kusadasi, and apparently wandered into an area where no one was used to seeing the cruise ship tourists. The shopkeepers kept asking us how we had found them. It was a long walk. The local shopkeepers were bending over backward to be nice to us. Whenever Kathy wanted a particular size of something they would send this little kid off running down the street to their warehouse or something, and a few minutes later the kid would return, still running, with the merchandise for Kathy to try on. Kathy really cleaned up. She was buying Calvin Klien, Versache, and all those expensive brands of clothing for like $3.00 a pair for the shorts. Yes, we are pretty sure they are knock-offs, but they were the right price if you have to replace your wardrobe quickly and in a foreign land. Kathy’s luggage did eventually show up. Since the luggage could not fly over there without a passenger on the plane they had to send it by train which took a little longer. But we were actually happy about the way it ended up. It was all fun. Racing to the Grand Bazaar, haggling with small shop owners, discovering cheap clothes, all just another small cruise ship adventure! Grand Bazaar in Istanbul Turkey!